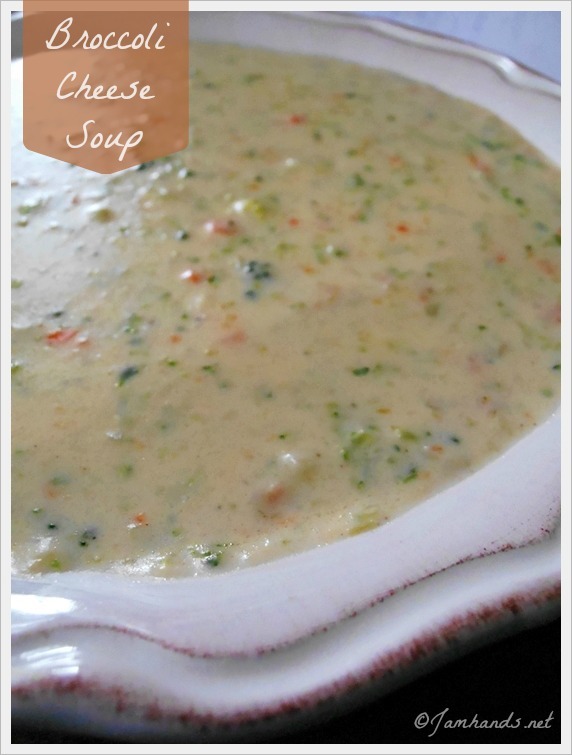 The best Broccoli Cheese Soup I have ever tasted! No processed cheese cubes in this recipe. While the ingredient list is a little longer than what I tend to make, the payoff is absolutely worth it. 1. Put the chicken broth in a large cooking pot. Finely dice the carrots, onion and celery and add to the chicken broth. 2. Add the bay leaf, salt, pepper, garlic powder, allspice and basil and simmer for 15-20 minutes. After simmering remove the bay leaf. 3. Place the broccoli pieces in a food processor and pulse until it is in small pieces. Add broccoli to the chicken stock and simmer an additional 20 minutes. 4. In a sauce pan, melt the butter. Add in the flour and stir constantly, making a roux. Incorporate into the soup by first adding a bit of broth to the roux, stir, then add more broth, stir, etc. Once it is well combined you can combine all the roux and broth mixture together in the pot. 5. Add the half and half. If you want to use a hand immersion blender to puree the soup to make it smoother, do so now. After, add the cheddar and heat over low heat. Recipe from my mom. It was adapted from a few different recipes which have been misplaced.